The Chairman, Independent National Electoral Commission, Mahmood Yakubu, has called on the private sector to assist in advocating for a peaceful election and voters’ turnout in the 2019 elections. Yakubu said this at the INEC Private Sector Forum organised by the Lagos Chamber of Commerce and Industry on Tuesday. He noted that the business community was one of the biggest beneficiaries of a stable political and economic environment. He said, “The business community is one of the biggest beneficiaries of stable political and economic environment resulting from the conduct of peaceful and credible elections. “The business community has a stake in our democracy of which the conduct of free, fair, credible and peaceful elections is an integral part. You are a major influencer of public opinion. Yakubu added that the impact of prominent businessmen and women advocating for peaceful election would lead to a considerable turnout of voters. He further urged the sector to assist the commission in voter education through corporate social responsibility, adding that the commission could leverage on their expertise to organise electoral logistics. 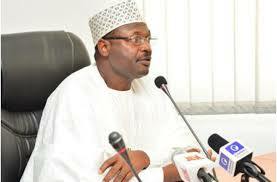 The INEC boss said, “The business community can assist in the area of voter education through corporate social responsibility. Those in advertising, telecommunications, transport, and the media can play important roles. We can work together to develop messages and the dissemination of same. “Many of you seamlessly delivered goods and service to customers. You have over time perfected the capacity to deliver products to the remotest locations nationwide. The President of the Lagos Chamber of Commerce and Industry, Babatunde Ruwase, who noted that the quality of political governance had significant implication on the sustainability of the private sector, said the sector could no longer be a spectator in the democratic and electoral process.